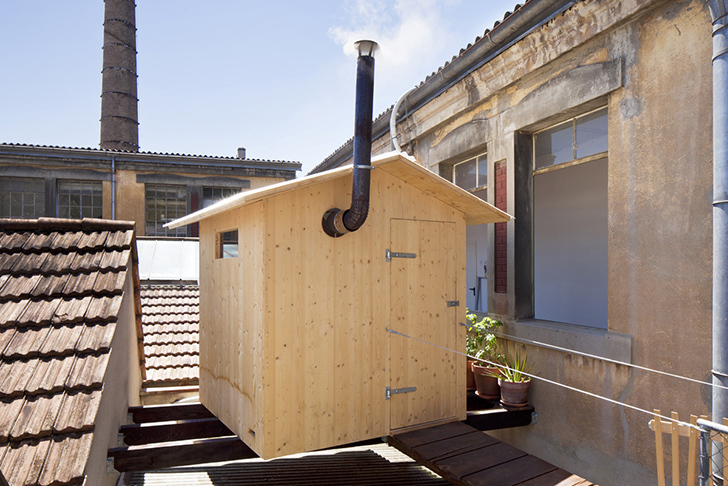 Swiss practice Bureau A and artist Jeremie Gindre built a tiny wooden sauna on top of a factory’s roof in Geneva. The shelter rests gently on strong wooden beams overlooking artist studios, and it's surrounded by an industrial landscape that contrasts nicely with its minimal design. Floating above the roof of the old Kugler factory in the center of Geneva is a simple wooden sauna to be shared by local creatives. Its design is very basic, and it looks similar to an adapted DIY shed. The sauna’s access is through a small wooden catwalk that hovers a few feet above the factory roof. The structure is made entirely from treated pinewood and its corrugated polycarbonate roof protects it from the elements. The minimal interior includes a wood-burning stove that provides enough heat and steam for sheltering during the snowy Swiss winters. During summer, the shed can be used as a space for reading, meditating or just getting away from it all. Standing within the roof of the old Kugler factory in the center of Geneva is a simple wooden sauna to be shared by local creators. 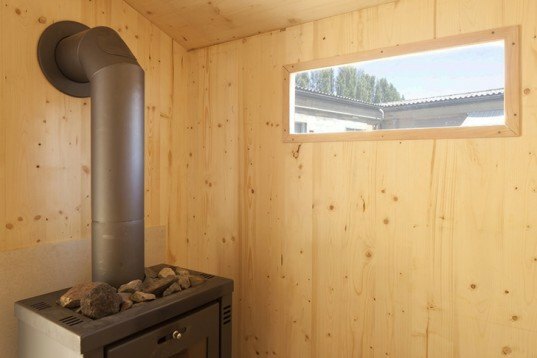 Its design is very basic and it could easily be an adapted DIY shed into a sauna. The sauna’s access is through a tiny wooden fence and bridge with greenery aside. It is entirely made from treated pinewood and its corrugated polycarbonate roof protects it from the elements. The minimal interiors include a wood burner stove that provides enough heat for sheltering during the snowy Swiss winters. During summer, the shed can be used as a space for reading, meditating or just getting away from it all.